If you cannot find fault with the issues discussed, find fault with the speaker. A classic example of this is the mainstream media’s reaction to Clint Eastwood’s speech at the RNC. The organization True Feminists points out this faulty approach because its members are all too familiar with attacks based on gender instead of substance. We strive to be valued as thinkers and doers, not as objects (of ridicule), which is how Eastwood is being treated. Please notice how she attacks Eastwood personally, but not on the issues. This is a classic technique to win an argument — discredit the opponent and thereby avoid the task of answering his or her points. Is this the way the media treats every public speaker? Unsurprisingly, no. Her saucy, plain-spoken keynote address, borrowing from the great tradition of vernacular Southern oratory, was one of the year’s political highlights. “We’re gonna tell how the cow ate the cabbage,” she said at one point. Notice how these journalists describe her comments as “saucy” and “plain-spoken,” even lauding them as being “in a great tradition.” That is not the way Eastwood’s astonishing performance at the RNC was received by an unappreciative Mainstream Media. Consider The New York Times, which denigrated Eastwood, intimating that he was “rambling” and “off-color” (he wasn’t) and asserting Ann Romney was only “trying to be positive” as she commented about it on the morning talk shows. Initially, there were no plans for Mr. Eastwood to take a chair onstage. But at the last minute, the actor asked the production staff backstage if he could use one but did not explain why. Looks pretty bad for Eastwood and (by association) the Republican party, doesn’t it? It sounds like Eastwood himself didn’t know he was going to use the chair! It seems as if the entire thing were impromptu, unplanned, as if the Republicans were bumbling around backstage. That would be a way to undermine and discredit them, right? But perhaps the actor simply didn’t need the chair until he was going onstage. It wasn’t a prop that had to be special-ordered, after all. Had Mr. Eastwood appeared earlier, many fewer people might have noticed. The networks began their hour of convention coverage at 10 p.m. Eastern time, which meant that Mr. Eastwood was the first act of the night for their millions of viewers. Oh, if only fewer people had seen his (courageous, pointed) remarks! Yet, this comment implies that everyone should be embarrassed by Eastwood’s disastrous presentation. None of these articles make mention of the numerous standing ovations his speech received, and the many laughs he garnered. Actor and director Clint Eastwood made the day of the GOP faithful at the Republican National Convention when he gave a surprise speech Thursday night in which he laid out what he sees as the good, the bad and the ugly state of American political affairs. Comedic takes on Eastwood’s speech went viral and all of a sudden, what might have been for some younger viewers a ho-hum speech by an octogenarian actor became both a national joke and a means to engage in the political process, political experts said. It was campaign malpractice that the Romney managers sent out a dithering, clueless Clint Eastwood. The Romney campaign will be lucky if Eastwood’s antics don’t linger as a national punch line,” Sabato wrote on his “Crystal Ball” blog. Notice how the commentator quietly (and unabashedly) commits age discrimination. (It’s is a block from gender discrimination, but in the same dangerous neighborhood.) How dare he? Oh, yes, he’s righteous in his disagreement with Eastwood’s views, but he’s too much of a coward to debate him on any them. 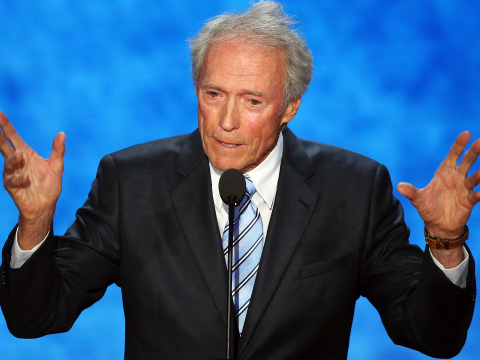 During his speech, Eastwood said he was crying for the 23 million unemployed Americans. The only problem: there are actually only 12.8 million unemployed Americans as of July, according to the Bureau of Labor Statistics, whose job it is to keep track of that sort of thing. Actually, 23 million reflects unemployed and underemployed. It’s “a national disgrace,” as Eastwood rightly points out. But the commentators only care that he was potentially “wrong” about a number. And it’s very telling that the only issue the opposition can debate in Eastwood’s speech is a figure that is arguably correct, and more importantly a valid point in general. The economy is bad, but that’s not what they want to discuss. In another article The Huffington Post takes it further, likening Eastwood to Kanye West when he stormed the VMA stage during Taylor Swift’s acceptance speech and suggested that Beyoncé deserved the award more. This completely irresponsible comparison is simply trying to condemn by association, and by belittling the star they call his entire speech into question, even if his comments themselves are brilliant and worthy of consideration. Destroy his credibility and win the day. True Feminists has a theory about why they are all so keen to malign Eastwood personally; they don’t want you to watch the speech, and if you do, they don’t want you to give it any credence. It’s the same way gender bigots denigrate women. Watch the speech (it’s 11 minutes), and see just how “bewildered” the audience is (they aren’t). Then You De-Side-by-Side.